Mom, the Intern: Toy Story 3 becomes a reality. Toy Story 3 becomes a reality. My mom is on this neighborhood Yahoo! group from which she regularly receives e-mails about the latest goings-on in her community. Most people use the e-mail group to buy, sell or give away goods. Mom has actually scored some pretty sweet deals by being on this list and I think she secretly enjoys the thrill of responding to a "FREE such-and-such!" e-mail seconds after it materializes in her inbox. Ok, so it's not a secret. She talks about it all the time. She often sends the deals my way if she thinks they're something I'd be interested in, so I'm used to seeing those forwards in my inbox. Not gonna lie, I kinda get excited about them, too. Especially when the word "FREE" is in the subject line. Who can resist free crap? NO ONE. I didn't forward this to you to see if you want to buy any of these, but look how sad this email is after watching the movie Toy Story . It almost seems like a joke!" "My son is selling his Toy Story toys. 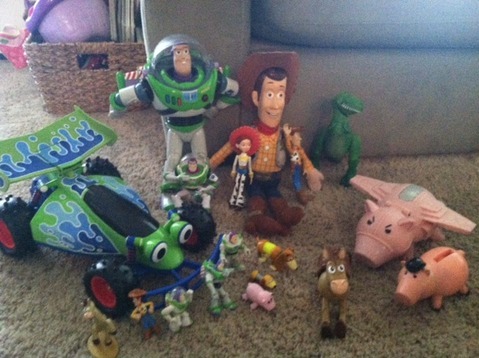 Small buzz (3), woody, Hamm, bullseye, stretch the dog (2) $1 each." I don't know you, but I beg you, KEEP THE TOYS! In case you've been living under a rock for the past, oh, 17 years, these guys come alive when you're not looking (duh). If you choose to follow through with this act of savagery, they will be forced to find a way out of your awful scheme. And their escape may involve inadvertently getting picked up by a garbage truck and sent to the dump where they will be burned ALIVE!!!!! unless the green aliens show up to save them. And don't even THINK about donating them to the nearest day care instead! Especially if said day care includes a magenta stuffed bear and a Ken doll who sounds an awful lot like Michael Keaton. Those toys have major chips on their shoulders from spending one too many days with slobbering ill-behaved hellions and, as a result, have turned into pure EVIL. Your kid may not love Woody, Buzz and their cohorts anymore, but they still love him. And they always will. So please, for the love of all that is good and holy, KEEP THE TOYS! If only for your future grandchildren (who will hopefully not be slobbery, ill-behaved hellions). A toy-lover who still hasn't forgiven her mother for donating her favorite stuffed Phoenix Suns bear to DI. Didn't expect becoming a toy rights activist this morning! Whew. i would totally buy these if I lived close by! i just ordered talking woody and buzz for Micah for christmas. I wanted to get RC and Rex, but didn't want to spend the money. DANG! I just finished wrapping a bunch of those toys for my girls. They are in love with Toy Story 1 and 2. My cousin told me that stuffed animals came alive and protected you during the night so up until maybe college, I always slept with one. I'm a believer.